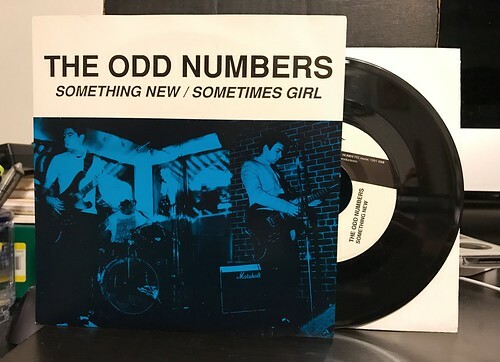 I Buy Way Too Many Records Dot Com: The Odd Numbers - Something New 7"
I decided that for the next few Mondays, I'll post something about the Odd Numbers 7"s I've picked up recently. I'm in the process of filling out their discography in My collection, so seems like an OK idea to me. As with all of their songs, the three on this Odd Numbers 7" certainly veer into mod/The Jam territory. "Something New" is a mid tempo entry to their catalog that was also on their albums Jazz Cigarettes and Retrofitted for Today. A lot of Odd Numbers songs do double and triple duty appearing on singles and albums. "Sometimes Girl" is a faster paced song and is just as catchy as anything they ever released. It also appears on the Retrofitted for Today album. The only song that is exclusive to this record is "Between the Two of Us. A short, poppy and stripped down blast, it actually reminds me quite a bit of the sort of thing Ted Leo would end up doing a few years later when he was playing on his own.